Texas Attorney General Ken Paxton confirmed on Wednesday that a video obtained by his office as part of its investigation into Planned Parenthood practices is “consistent” with other undercover videos released by an anti-abortion group. Texas Attorney General Ken Paxton confirmed on Wednesday that a video obtained by his office as part of its investigation into Planned Parenthood's practices is “consistent” with other undercover videos released by an anti-abortion group of the organization’s executives discussing fetal tissue donations. Testifying before the Senate Health and Human Services Committee, Paxton said his office had “gained possession” of “hours of recordings” involving a Planned Parenthood clinic in Texas as part of its inquiry into Planned Parenthood’s practices regarding fetal tissue donation in Texas. Paxton declined to go into specifics about the recordings and how they were obtained. Instead, Paxton detailed a recent visit by AG investigators to a Planned Parenthood facility in Houston where they witnessed how the abortion provider handles fetal remains before they are sent to a contractor who disposes them. "The true abomination in all this is the institution of abortion," Paxton told the committee. "Even the languages that they use — 'product of conception' — betrays a profound denial of humanity." The revelation comes days Planned Parenthood Gulf Coast told The Texas Tribune that two people “fraudulently representing themselves” as research executives and providing fake California driver’s licenses toured its Houston facilities in April “under the guise of discussing tissue research” with Planned Parenthood’s staff. Rochelle Tafolla, a Planned Parenthood spokeswoman, said the two people who visited the Houston facility identified themselves as executives with Biomax Procurement Services, a shell company created by the Center for Medical Progress. That group is behind the hidden-camera videos depicting Planned Parenthood executives in California talking about how their providers obtain fetal tissue for medical research. Tafolla had said the organization suspects that the two individuals secretly taped that visit, which included a tour through a center where abortions are performed. The videos previously released by the Center for Medical Progress also appear to have been stealthily recorded by actors posing as buyers for Biomax. Multiple requests for comment from the Center for Medical Progress have not been returned. After they were unable to gain access to the video obtained by the AG’s office, Planned Parenthood representatives in Texas declined to testify in person before the committee and sent the committee written testimony instead. The organization’s written testimony included a timeline of Biomax’s visit and details about an unsolicited “procurement agreement” the fake company sent to Planned Parenthood. In that contract, which Planned Parenthood rejected, Biomax offered to pay $1,600 for a liver and thymus — “an astronomical amount compared to the minimal cost recovery fees that tissue donation programs currently recoup,” the group wrote in its testimony. Republican committee chairman Charles Schwertner initially said the written testimony would not be entered into the official record because no representative from the organization had submitted a witness card. Hours into the hearing, Planned Parenthood attorney Deborah Hiser entered the hearing room to submit a card. Pressed by Schwertner to testify before the committee, Hiser declined and said she advised her clients not to testify because the attorney general's office had served them with subpoenas as part of its investigation. The organization later confirmed that subpoenas seeking access to documents were sent by Paxton's office to its three affiliates in Texas: Planned Parenthood Gulf Coast, Planned Parenthood Greater Texas and Planned Parenthood South Texas. Planned Parenthood facilities that participate in fetal tissue donation can donate the tissue for research if a patient consents, according to the organization. Federal law allows clinics to be reimbursed for costs “associated with the transportation, implantation, processing preservation, quality control, or storage of human fetal tissue” for research purposes. Planned Parenthood health centers in Texas do not currently donate tissue for medical research, according to the organization. The Gulf Coast affiliate in Houston participated in fetal tissue donation as late as 2010, when it partnered with the University of Texas Medical Branch at Galveston for a study on causes of miscarriage. Lawmakers on the Senate Health and Human Services Committee were given access to view that video ahead of Wednesday’s hearing under the legislative privilege provided to members of the Legislature by open government laws. Legislative privilege allows state agencies to provide confidential information to lawmakers who request it "for legislative purposes." Members of the committee were asked to sign nondisclosure agreements after viewing the video obtained by the AG’s office. In light of Planned Parenthood’s absence at the hearing, Republicans on the committee condemned the organization. “I think that shows, in some ways, their true colors,” Schwertner said. Meanwhile, Democrats on the committee asked that the lawmakers avoid making “premature” indictments of the organization and wait for the results of ongoing state investigations. Paxton said the AG’s investigation, which is being considered both a civil and criminal investigation, would probably extend into the next month. 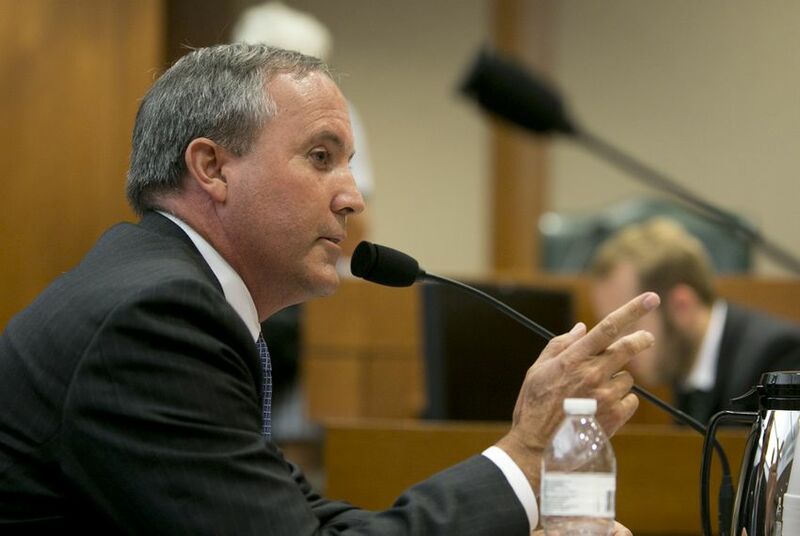 Prodded by lawmakers about any early findings, Paxton said it was “too soon” to answer questions on whether Planned Parenthood clinics in Texas broke any laws related to fetal tissue. Texas Department of State Health Services officials also fielded questions from committee members on how Texas oversees fetal tissue donations. But the agency does not currently have jurisdiction to regulate that process, officials said. Kathy Perkins, the agency's assistant commissioner for regulatory services, also told the committee that DSHS has received complaints regarding the handling of fetal tissue in the last couple years, but no complaints have been substantiated. Citing policies in other states that ban fetal tissue donation, Republicans on the committee made clear that they would like to increase DSHS's jurisdiction on the issue or consider a similar ban in Texas — proposals supported by four representatives from anti-abortion groups who also testified before the committee. Heather Busby, executive director of NARAL Pro-Choice Texas, said groups that advocate for abortion were not invited to testify. Ally Mutnick contributed to this report.